Ever wanted to pet a tiger? This week’s Photo Friday comes from Meet, Plan, Go! 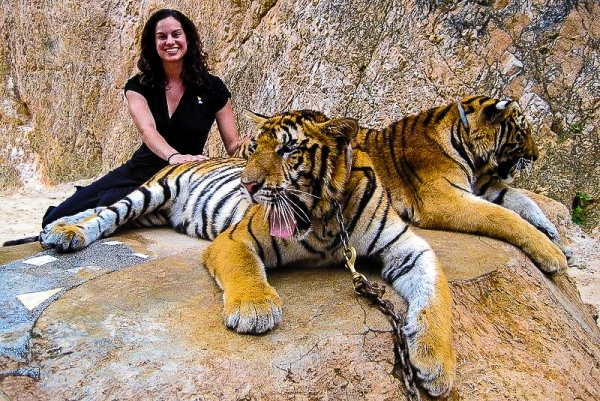 Boston host Lillie Marshall who had a chance to get up close and personal with several tigers when she visited Thailand’s Tiger Temple during her career break two years ago. Today, Lillie is back in Boston, where she has launched a movement through TeachingTraveling.com to inspire and assist more teachers to travel, and more travelers to teach, thus transforming the educational experience of our world. You can read more about Lillie’s travels on AroundtheWorldL.com or follow her on Twitter as @WorldLillie. To be the first notified when tickets go on sale this fall, sign up for our newsletter. [singlepic=1552,250,,,right]After her original 16-month career break, Sherry Ott decided not to go return to the “Briefcase” world and settled in Vietnam, teaching English for a year. As an expat living in Ho Chi Minh City (Saigon), Sherry wanted to embrace life as a local, which included learning to navigate the hectic streets by motorbike. For many countries, motorbikes are the main source of travel – it’s not uncommon to see people transport livestock, refrigerators, and families of 5 or more on two wheels, even during a monsoon. And rather than just become another passenger, Sherry decided that she wanted to take control of the motorbike. [singlepic=1554,250,,,left]Though her rented bike spent it’s first weeks parked in her living room, Sherry eventually got over her fear of taking it on the road, even obtaining a “license” in hopes of being a legal driver. In her “Motorbike Diaries”, Sherry opens up about the ups and downs of this experience, with witty observations of the motorbike culture in Vietnam. And within time, she finds herself to be fitting right in – masks and rain ponchos included. Borneo was one of the destinations I visited during my 16-month career break. Following is an excerpt from my blog. [singlepic=958,200,,,right]When my friend Russ and I decided to go to Borneo, we had a single goal – to climb Mt. Kinabalu, the highest peak in SE Asia. Ever since the sad day that I was banished from Kilimanjaro due to altitude sickness, Mt. Kinabalu in Borneo had been in my sites. I thought that even though I couldn’t make it up to 19,000 ft. (Kilimanjaro), I should be able to make it to 13,000 ft. (Kinabalu). I had determination – an intense determination that had been building since Africa. The literature about the climb said that a reasonably fit person could summit. It takes two days to make the 8.5km climb – the first is spent going up, up, up from 5000 ft. to about 10,000 ft. where you hunker down in a lodge/hut. The hut is basically an unheated wooden structure that pretty much resembled most of the hostels I have been staying in. Bunk beds, shared bathroom, luke warm water at best. On day 2 you are to get up at 3AM and start on the summit route in the dark. You make it to the summit (13,435 ft.) by sunrise. The temperatures around the summit are normally right around freezing – 32 degrees – and the wind is brutal. [singlepic=950,200,,,right]My curiosity with Borneo started around the year 2000 when I was living in San Francisco. I had just moved to the west coast and I was up late one night watching television. I came across the Eco-Challenge, an adventure race that featured a variety of crazy and dangerous sports including hiking, mountain biking, kayaking through rapids, horseback riding, caving, and abseiling. It could take teams anywhere between 3 and 6 days to complete and it was in a place called Borneo. I had never heard of it before, but it sounded and looked completely exotic – this sheltered mid-westerner was hooked.